The Massachusetts Department of Transportation (MassDOT) announced the Department will be rehabilitating the surface of the Tobin Bridge and complete required maintenance to improve the structure which will require lane closures and result in significant traffic impacts on the Tobin Bridge and Chelsea Curves section of Route 1 beginning April 1. These impacts will lead to increased travel times on sections of Route 1 northbound and southbound for drivers and MBTA bus customers. The Department also released details about transit options available to travelers such as free fares in the inbound direction on the SL3 bus line offered at the Chelsea, Bellingham Square, Box District, and Eastern Avenue stops for the duration of construction. The MBTA also announced that they will be running additional MBTA Blue Line trains to additional capacity, and these measures will be funded by MassDOT Highway Division project funds. Beginning April 1, lane closures on the Tobin Bridge northbound will be put in place, although two of three travel lanes will be open during daytime hours. One of the three travel lanes on the Tobin Bridge northbound will be open during overnight hours. Beginning by early May, Route 1 travel lanes in the Chelsea Curves area will be reduced so that two of three north and southbound travel lanes will be open in the daytime. One of three north and southbound travel lanes will be open during overnight hours. The MBTA said they will be offering the free fares on the Silver Line and the Commuter Rail during construction. MassDOT’s traffic modeling suggests that on Route 1 northbound, afternoon peak travel times could increase in duration and have significant delays. Vehicle backups are expected to extend onto the I-93 ramps, along the Leverett Connector, and towards Rutherford Avenue. On Route 1 southbound, morning peak travel times could similarly increase in duration with significant delays expected. MassDOT is carrying out work on the Tobin Bridge and Chelsea Curves section of Route 1 at the same time so that these projects will be completed in 2021. If the projects were done at separate times, drivers would be inconvenienced for additional years. This work will eliminate the need for weight restrictions and postings, and MassDOT will use accelerated construction techniques to shorten the overall construction time. •Dial 511 before heading out onto the roadways and select a route to hear real-time conditions. •Visit HYPERLINK “http://www.mass511.com” t “_blank” www.mass511.com, a website which provides real-time traffic and incident advisory information, access to traffic cameras, and allows users to subscribe to text and email alerts for traffic conditions. •Follow MassDOT on Twitter @MassDOT to receive regular updates on road and traffic conditions. •Check parking availability at the T’s 8 largest garages @MBTA_Parking. •Download MassDOT’s GoTime mobile app and view real-time traffic conditions before setting out on the road. Last Friday members of the state legislature, including Speaker Robert DeLeo and Rep. Dan Ryan, attended the annual Legislative Breakfast at the Chelsea Soldiers’ Home. While the breakfast’s format usually gives the opportunity for Soldiers’ Home staff and residents to lobby for more legislation that helps and protects veterans, last week’s breakfast centered around the new long-term care facility being constructed at the Soldiers’ Home. State lawmakers, including Speaker Robert DeLeo and Rep. Dan Ryan, attended last week’s legislative breakfast at the Chelsea Soldiers’ Home. In October Gov. Charlie Baker broke ground on the new long-term care facility. The current facility will continue to be fully operational, caring for 154 veterans, during the construction process with an anticipated project completion date in 2022. 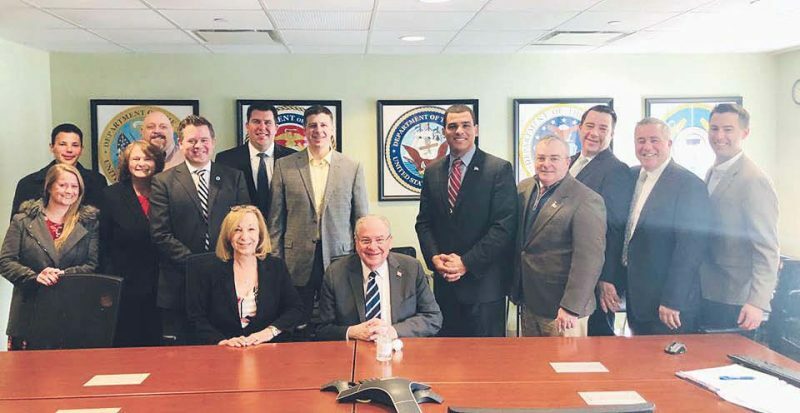 “Friday I joined my colleagues to hear from Superintendent Cheryl Poppe of the Soldiers’ Home in Chelsea and Secretary of the Massachusetts Department of Veterans’ Services, Francisco Urena, about the incredible new treatment center that will soon be built on their campus,” said Rep. Ryan. “This investment will ensure that our veterans continue to receive the best possible care in a new, state of the art facility. In May 2017, Baker announced plans for a new long-term care Community Living Center (CLC) and signed legislation authorizing funding needed to advance the project in Chelsea. The Baker Administration also has received funding authorization from the United States Department of Veterans Affairs (VA) for the $199 million project. The federal funding was awarded through the VA’s State Home Construction Grant Program which provides reimbursement of up to 65 percent of construction costs for approved projects. The Administration, with strong support from the Legislature, plans to spend approximately $70 million net of federal reimbursement on the project. The Soldiers’ Home first opened its doors to Massachusetts veterans in 1882. The first residents were Civil War veterans who were wounded or unable to care for themselves, many of whom had previously resided in the Commonwealth’s “alms houses”. The pieces continue to fall in place for the proposed 330-unit mixed-income redevelopment of the Innes Housing Development on Central Avenue. Tuesday night, the City Council held a public meeting with state officials and developers on the 40R Smart Growth overlay zoning that the council will need to approve before the City can become eligible for at least $11 million in state funding for the project. In addition, with passage of the 40R zoning, Chelsea could receive a little over an additional $1 million from the state’s Department of Housing and Community Development (DHCD). About half of that money would go to Corcoran Development, which has partnered with the Chelsea Housing Authority (CHA) to redevelop the Innes Housing Development in two phases. The 96 public housing units will be re-developed with 40 middle-income (80 to 120 percent of the AMI) units and 194 market rate units. The project will go in two phases to reduce relocation of residents. “We’re having this meeting so we can have more understanding about the 40R zoning amendment for smart growth,” said Judith Garcia, the District 5 Councillor. The Planning Board is expected to make a recommendation on the smart growth zoning at its next meeting Tuesday night, clearing the way for a final City Council vote. The basic requirements for a 40R district are an eligible location preferably in a city or town center, near public transportation, and allowing minimum by-right density of eight single-family units, twelve 2-3 family units, and 20 multi-family units per acre, according to William Reyelt of the DHCD. “It has to be primarily a residential district, but we do encourage mixed-use development,” said Reyelt. In addition, age restrictions cannot be required in the smart growth districts, and 20 percent of the total units must be affordable, he said. Once the zoning is approved by the city and then verified by the state, the city will get its first incentive payment from the state, Reyelt said. With smart growth zoning, communities are also eligible for additional density bonuses and school reimbursement payments. Currently, there are 47 smart growth districts in 41 communities across the state, Reyelt said. Unsurprisingly, parking was the biggest area of concern raised by City Councilors during the question and answer portion of Tuesday night’s presentation, although there are no specific parking requirements or regulations built into the 40R zoning. There will be 276 parking spaces on site, and the developer has said they are willing to do traffic and parking studies to perhaps help the overall neighborhood with street parking. Initially, the developers proposed 226 spaces, but Ronnie Slammin of Corcoran said an additional 50 spaces are now in the plans. The current CHA residents are eligible for street parking permits, and will continue to be able to park at the redeveloped Innes housing for free as part of the CHA’s 99-year lease with Corcoran. But several councilors said they still had concerns about how parking would impact the neighborhood. “Before the Council moves forward, that will definitely have to be on the table,” said District 8 Councillor Calvin T. Brown. District 1 Councillor Robert Bishop said he wants to make sure the current CHA residents are allowed to park on-site and not forced on the street for parking. District 4 Councillor Enio Lopez said he wanted assurances that the 96 public housing units would remain under CHA control. “Those 96 units will always be filled by public housing tenants,” said CHA Director Al Ewing assured. Dr. Alfred Donatelli, chair of the Chemical Engineering Department at UMass/Lowell, will lead an interactive, hands-on STEM demonstration for parents and children on Saturday, Feb. 23, at 11 a.m. at the Chelsea Public Library. The demonstration is part of the Black History Month series of events put together by the Lewis Latimer Society and Museum, led by Co-Directors Ronald Robinson and Leo Robinson, and the Chelsea Balck Community, led by President Joan Cromwell. The event is being held to promote the importance of STEM education to youth, who are the future engineers and scientists. Dr. Al will demonstrate how to make super-cool, homemade ice cream with nitrogen, how Slime and Super balls are made from every-day materials and ingredients that we find in our homes. Dr. Al and his team of assistant, which include Ken Umemba, members of the Lewis Latimer Society and Museum, Chelsea Black Community, and Bunker Hill Community College, will explore the application of these benign experiments in chemical engineering reaction kinetics and reaction design, mechanical engineering thermodynamics and heat transfers, emulsion polymerization in plastics engineering, and in weightlessness when astronauts land in space.